Jews worldwide are more imperiled than they have been for decades. 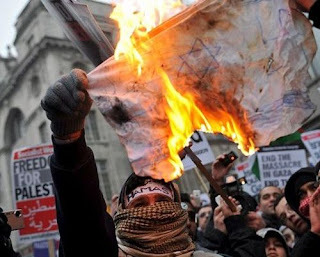 A new study shows that worldwide incidents of anti-Semitism, from vandalism to arson and beatings, were twice as frequent in 2009 as they were in 2008. The study, released last Sunday by Tel Aviv University’s Stephen Roth Institute for the Study of Contemporary Anti-Semitism and Racism, records that anti-Semitic incidents reached their highest level last year since the university started keeping these records in the 1980s. AP makes no mention, of course, of how, during the Israeli Gaza incursion, Hamas staged attacks from civilian areas in order to provoke retaliatory fire it could use for propaganda purposes. Yet just weeks ago, the Intelligence and Terrorism Information Center, an Israeli research group, released a 500-page report documenting Hamas’ use of human shields and its deliberate placement of rocket launch sites near mosques and hospitals. Nothing better to stir up international indignation against the Jews than an Israeli missile hitting a hospital or house of worship — and Hamas wanted to make sure it happened. Of course, it worked magnificently: The UN even released the “Goldstone Report,” enshrining Palestinian propaganda against Israel, including charges that Israeli forces recklessly targeted civilians as established fact. The flimsiness of this “established fact” was underscored last week when a Palestinian teenager whom Palestinian authorities had reported as having been shot by the Israelis turned up at home. He hadn’t been shot at all, but actually wandered into a weapons-smuggling tunnel that took him into Egypt, where he was briefly held by Egyptian authorities. Yet UN researcher Goldstone relied upon Palestinian sources — including, no doubt, many with the same vivid imagination — to compile his report. The “Goldstone Report,” not coincidentally, was spearheaded by the Organization of the Islamic Conference (OIC), the 56-nation group that now constitutes the UN’s largest voting bloc. The ultimate purpose of the “Goldstone Report” is to criminalize legitimate Israeli self-defense. And now the new report on anti-Semitism, however unwittingly, plays into this by attributing Muslim “boiling over” against Jews in Western Europe to rage over Gaza. It was all just a “backlash” — all the fault of the Israeli atrocities in Gaza. Islamic anti-Semitism, with its centerpiece the deeply ingrained idea that the Jews are the worst enemies of the Muslims (as Koran 5:82 says), doesn’t seem to have been considered. The fact that the Israeli atrocities in Gaza were manufactured products of the Palestinian propaganda machine doesn’t seem to have entered in, either. But in contrast to the Israeli war crimes in Gaza, the rise in anti-Semitism worldwide is real. The United Nations and the global human rights organizations, instead of accepting OIC-manufactured propaganda uncritically, should examine honestly and openly the ways in which imams in mosques in Europe and elsewhere are encouraging hatred of Jews, and call upon Islamic organizations around the world to clean their own house. The study released last Sunday makes this all the more urgent, but with the increasing isolation of Israel and its ongoing bullying by Barack Obama, such a necessary reckoning is about as likely as Mahmoud Ahmadinejad’s converting to Judaism.